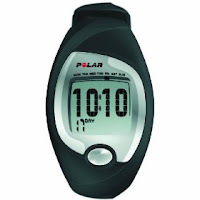 This is the Polar FS3C Heart Rate Monitor - very basic, reasonably priced, and incredibly simple to operate. It has ONE button. Just one. And once you're working out, you don't even need to press it. That's right - it will scroll through the different display screens like magic! All you do is hold the wrist unit near your chest (where the HRM strap is) and voila! It beeps and scrolls! Love it! No bells, no whistles. No personalized workouts, no percentages, no nothing. Just the time of day, the elapsed time exercised, and your heart rate. And a back-light, of course, for those of us who hop on the treadmill before dawn and refuse to turn the light on. I currently have mine set with a minimum heart rate of 130 and a maximum of 139 (my target zone for cardio workouts) and the wrist unit will beep at me if I am outside of those perimeters.